More good news for Mahahual. The third stage of the malecon improvements are due to start soon. I translated the article below from http://www.infomovilnews.com, a website that provides news from Mexico. 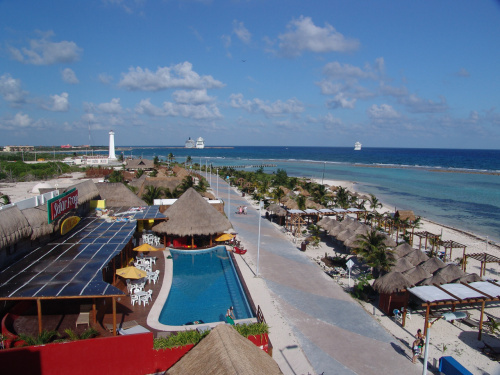 This article shows the emphasis being placed on Mahahual and Costa Maya for tourism growth in the future, by the Mexican government. Remember this article is translated intact from Spanish, so it is a little different from the news you read in the USA or Canada. Also construction on the new water park is being started this month, so that will also provide more tourists to Mahahual. * Raul Andrade Angulo, Undersecretary of Planning and Development of the State Secretary of Tourism, noted that the third stage of Mahahual Malecon bring greater dynamism to the cruise port and will provide better conditions of stay tourism. 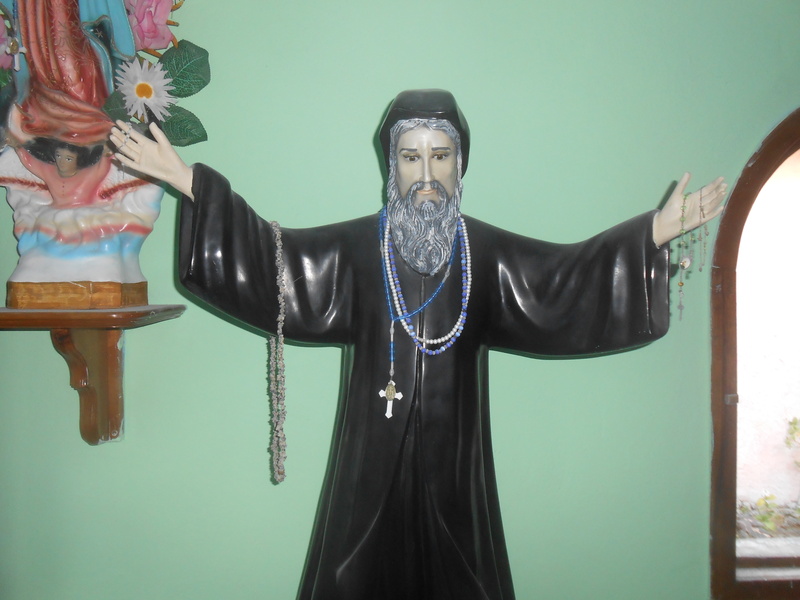 CHETUMAL, Quintana Roo, on September 29. – Through the efforts of Governor Roberto Borge Angulo, the Ministry of Tourism (SECTUR) allocated 20 million pesos to build the third stage of the Malecón in Mahahual, before the end of this year, work will cover 580 linear meters, with an average width of six meters, street lighting, street furniture, pedestrian walkway, landscaping and signage. 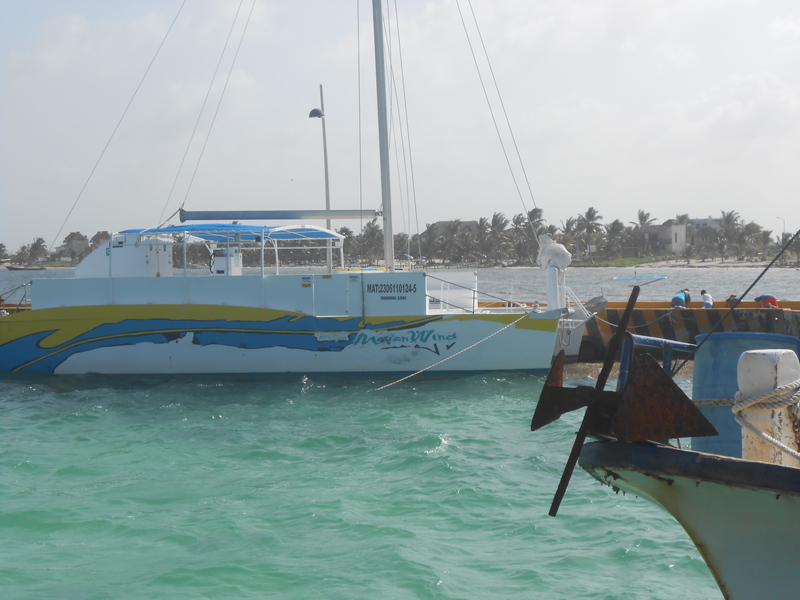 ‘Those works will stay comfortable as tourism, estimated at 400 thousand visitors arriving via cruise ship and you will find a modern Mahahual, at the height of their recreational needs of the Governor said. 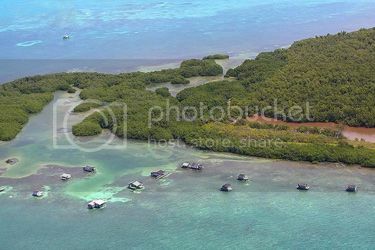 The Chief Executive noted that investment is the result of negotiations with the federal authorities of Tourism, with the support of President Enrique Peña Nieto, who has spared no support to continue promoting tourism projects that keep Quintana Roo as the first tourist destination Latin America. He stressed that his administration has prioritized the construction and modernization of urban infrastructure in Cozumel and Mahahual, major points for the reception cruise to ensure better conditions and expanding expectations for economic benefit for service providers. -For Achieve this support was crucial celebrating “Mexico Tourism Tianguis 2014” in Cancun, because it was an opportunity to spread the Grand Costa Maya as one of the realities of tourism in the south of the state, with great potential for development, today are concretized with the construction of the third stage of the Malecón in Mahahual I stress it. The Governor stressed that Mahahual is among the most important Caribbean cruise routes and receives an average of eight vessels each month. In this place also reaches national and international tourism road. Escamilla Fernando Carrillo, head of Sintra, said the levee project includes improving intersections, horizontal and vertical signage, landscaping, street furniture, street lighting, sidewalks and fittings and pedestrian walkway. ‘The benefits to this third stage of the Malecon in Mahahual will be reflected directly to service providers; who will offer better conditions for the destination, with a pedestrian pathway in which tourism travels in comfort and safety I stress. Undersecretary of Planning and Development of the State Secretary of Tourism, said that the third stage of Mahahual Malecon bring greater dynamism to the cruise port, while providing the best conditions of stay for domestic tourism and international visiting this resort. Finally, said the chief executive’s instructions are precise and aimed at further improving the tourism infrastructure throughout the state to maintain hegemony in tourism in Latin America. 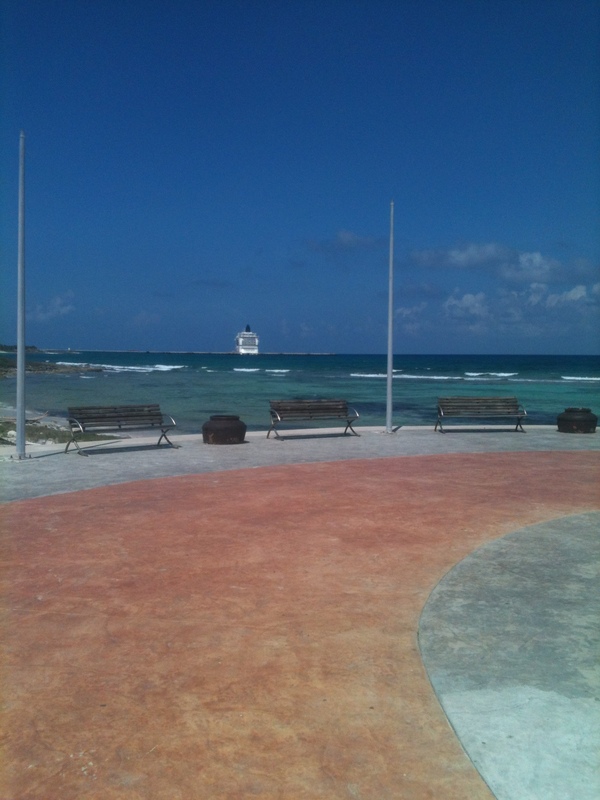 Mahahual after the cruise ships leave. 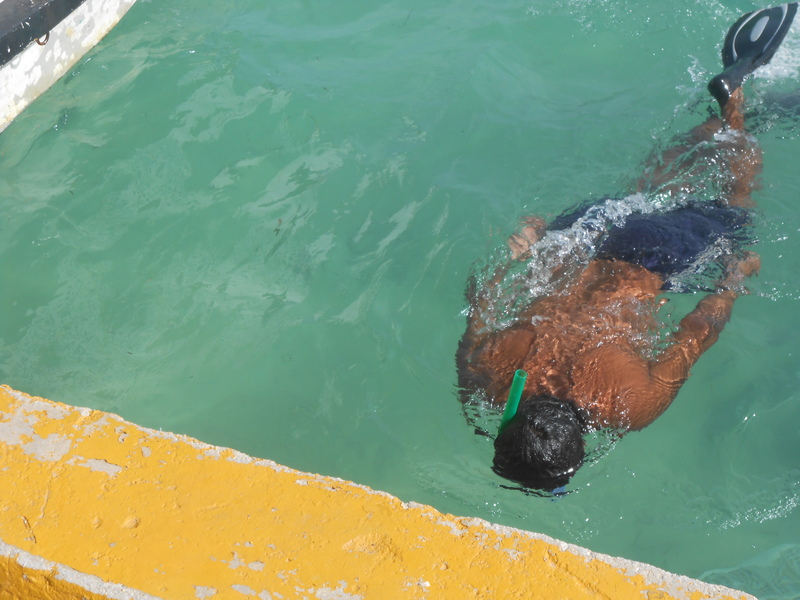 This is another step in making a Mahahual a world-wide tourist destination. 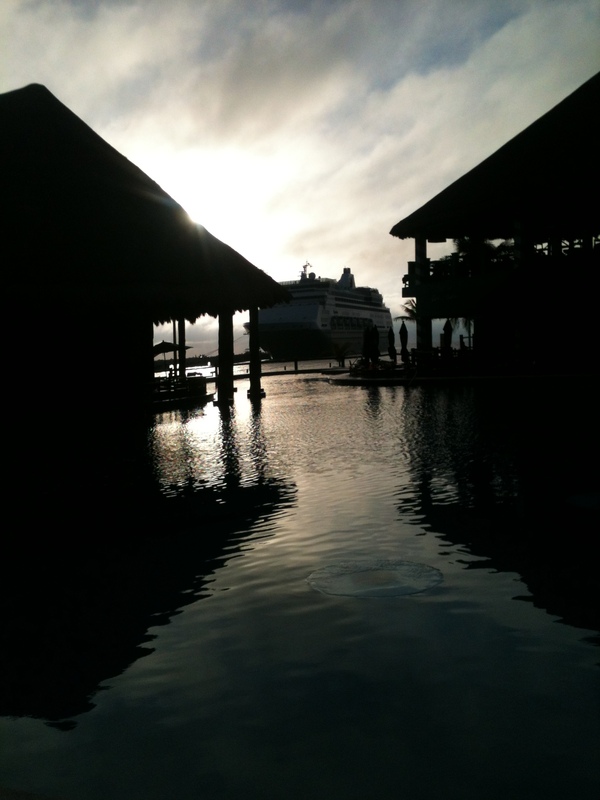 I myself am glad I am there to witness this and be a part of Mahahual’s growth and future. 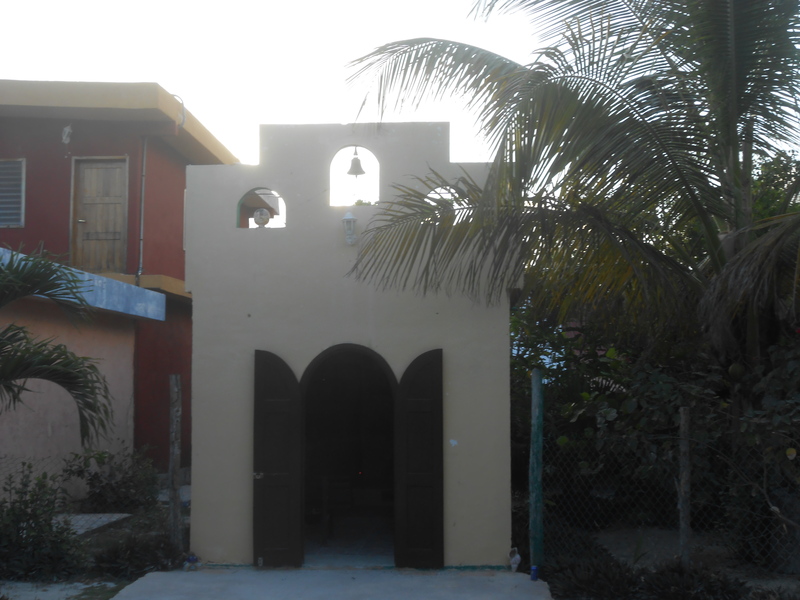 So if you are interested in living or retiring in Mahahual in the near future, you may want to make plans now before everybody else discovers how great a place Mahahual is, and beats you to it. 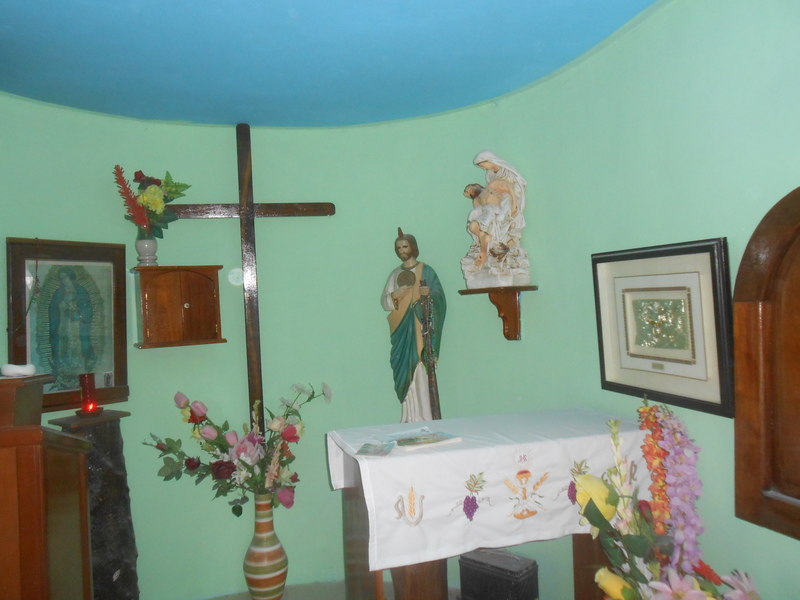 On the coastal road south towards Xcalak, there is a little Catholic Church. 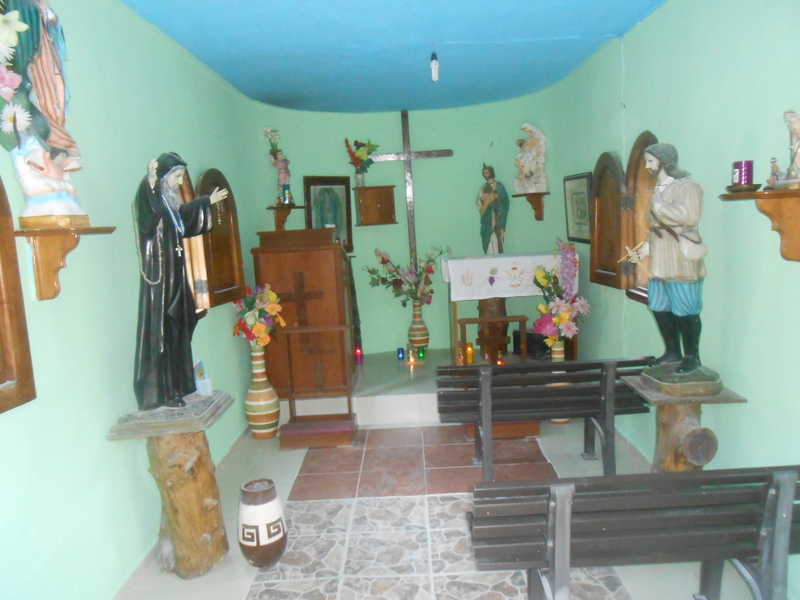 It is around 10 kilometers south of Mahahual, and I have been told it is the littliest church in Mexico. I drove by one day and I had to stop to take some photos. I was going through some old pictures and came across these, and thought I would post. I don’t know if they still hold services there anymore, but it is a cute quaint little building, and the smallest church I have ever seen. If you ever are going south from Mahahual, you might want to stop in a take a look. I was on the pier in Mahahual awhile back trying my hand at some fishing, when I noticed a lot of activity at the end of the pier. I put down my pole and went to have a look. 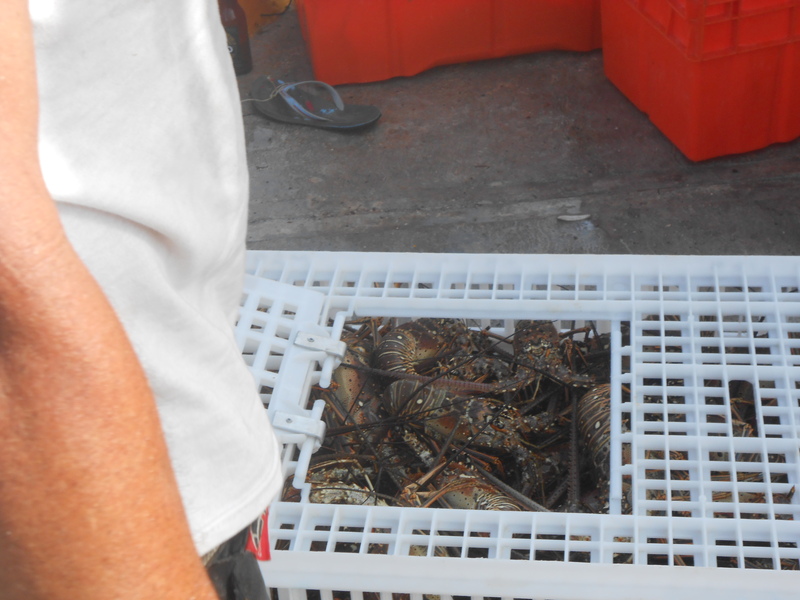 Come to find out the local fishermen were bringing in the lobster harvest. 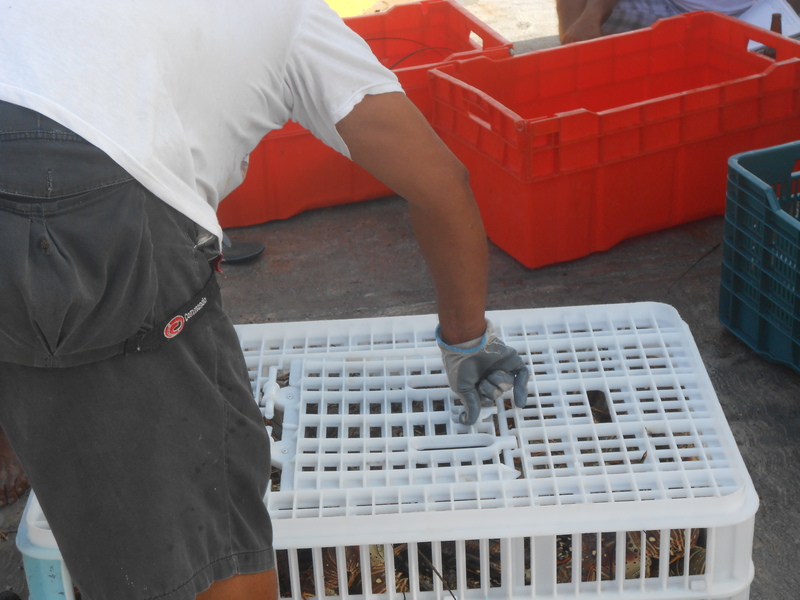 i stood and watched while the boats unloaded the lobster cages and traps, and separated the lobster to be sent to market. It was an interesting process, and I took some photos to show how it is done. 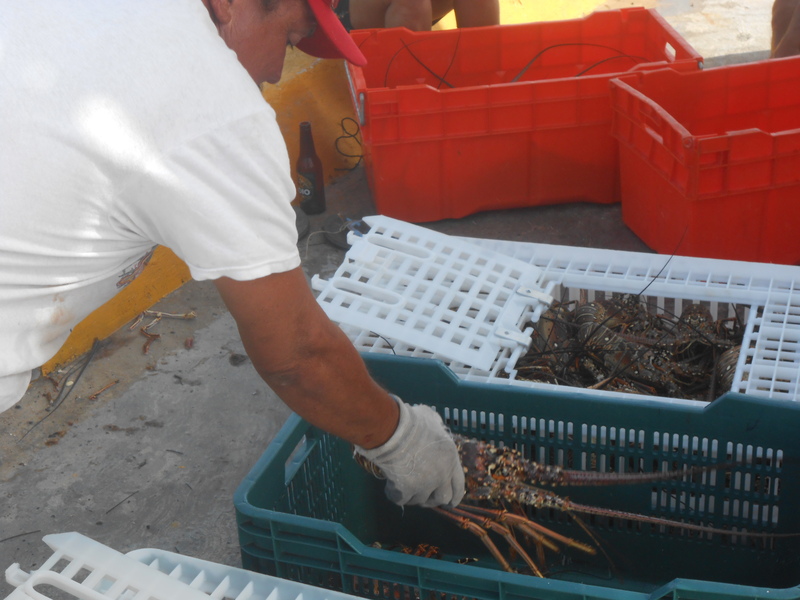 Fresh lobster is very popular during lobster season in all the restaurants on the malecon in Mahahual. 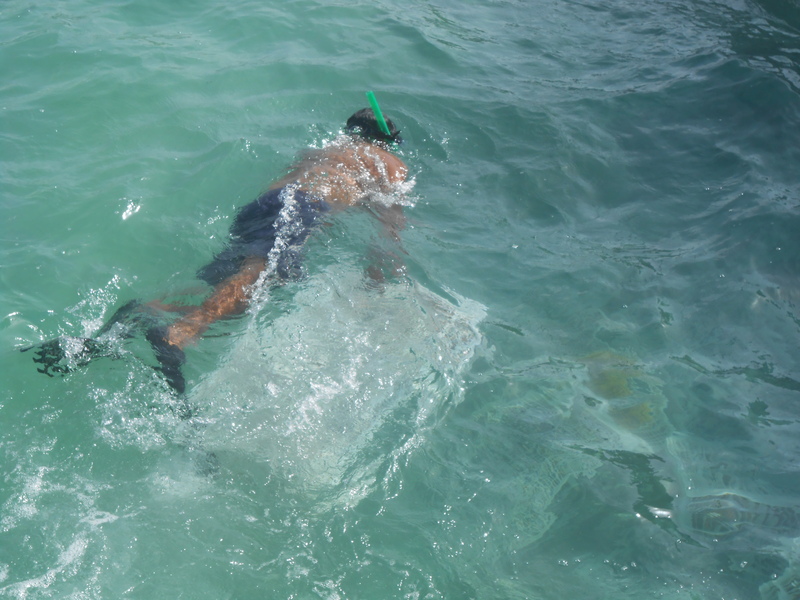 A lot of people in Mahahual spear fish to catch lobster around the reef. The lobster here are not big red ones like you see in Maine and the USA, but smaller brown lobster, but they still taste good. 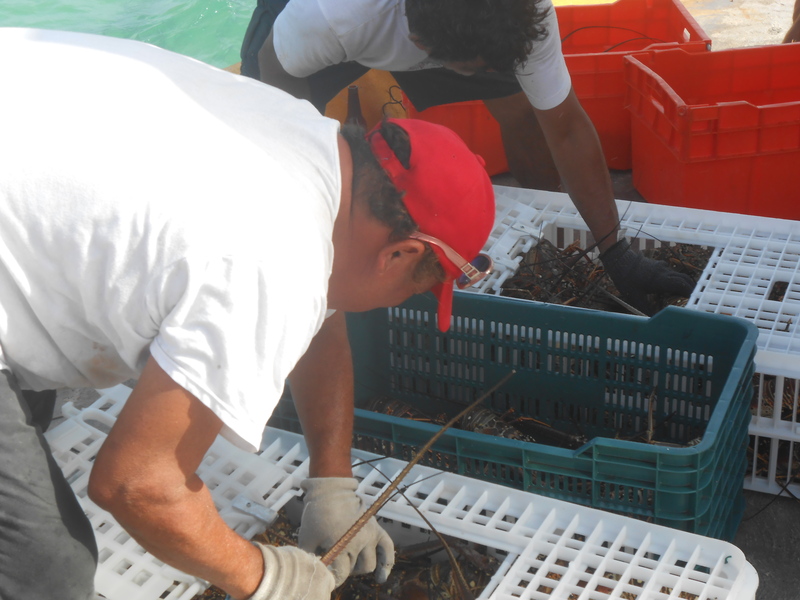 In Mahahual lobster is used in a variety of dishes, like pizza, pasta, soup, and just about any way you can think off. 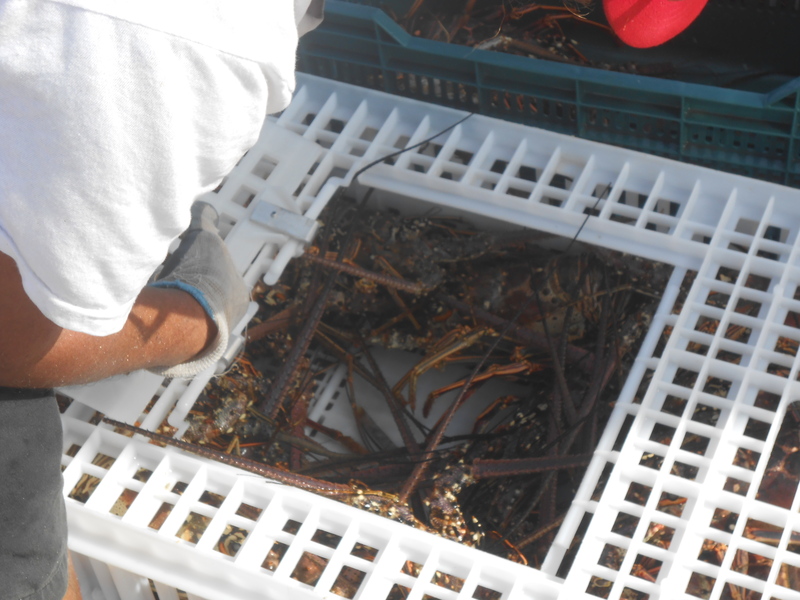 There is nothing like a fresh lobster right out of the sea. 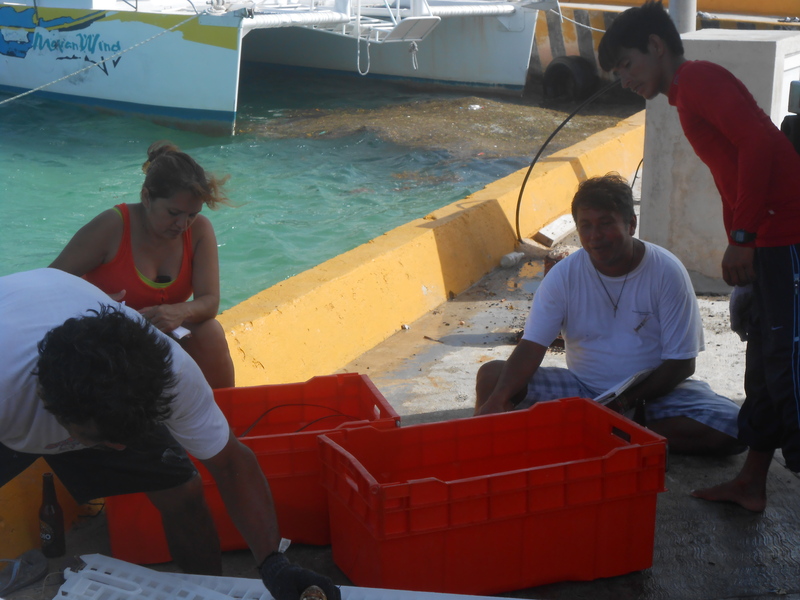 There is a fishing cooperative in Mahahual that fishes for lobster and all the other seafood that is provided for the Mahahual community. 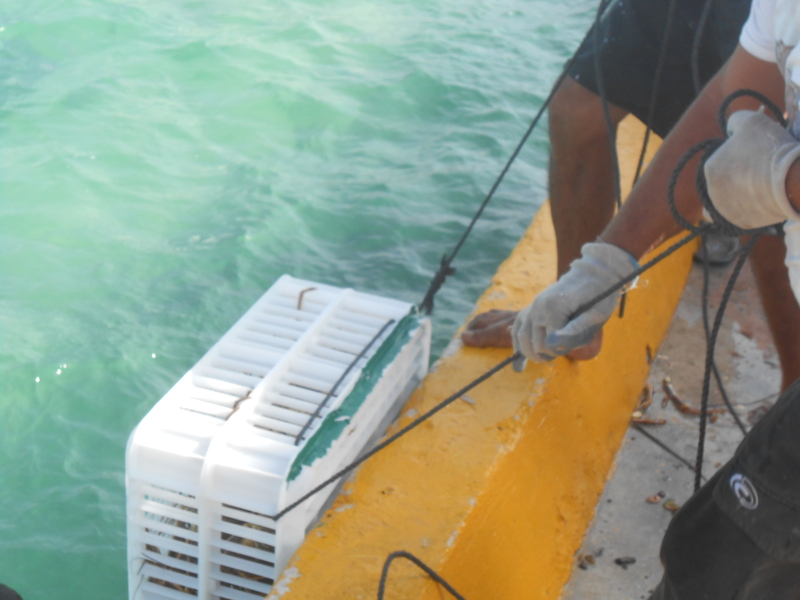 They take care to protect the reef, and to make sure it is not over fished, so it will be here for years to come. Also the Mexican Navy patrols the area to help guard against poachers and illegal fishing. 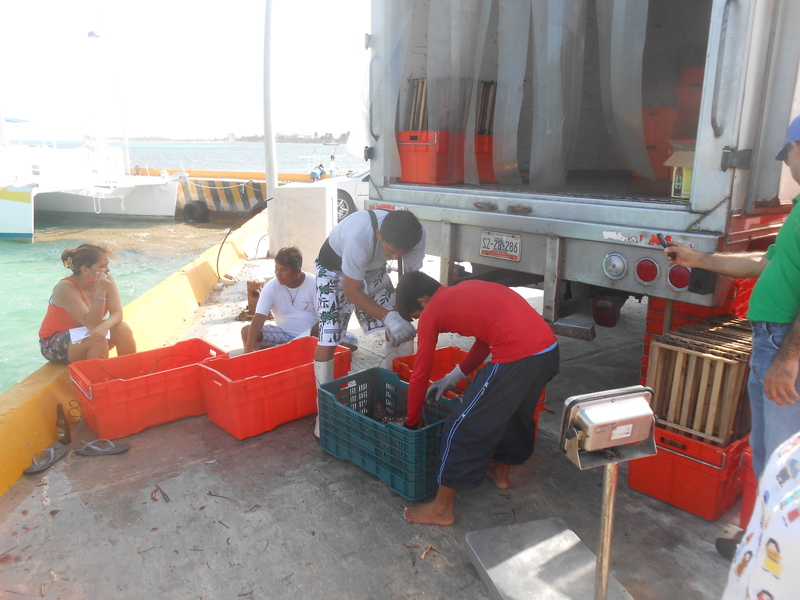 So here are some photos to give you some kind of idea how lobster is brought to the market in Mahahual. Boats drop cages into water. Guy dives down to bring up cages. 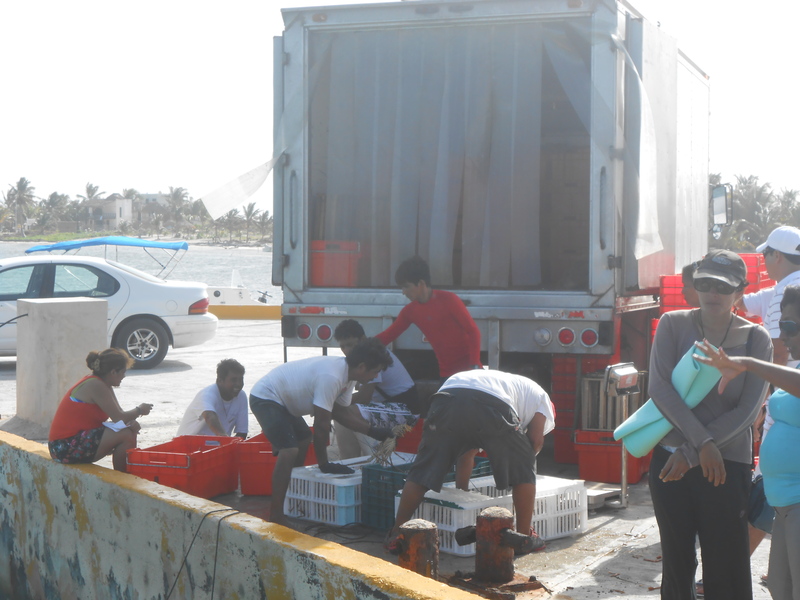 Loading into truck for market. 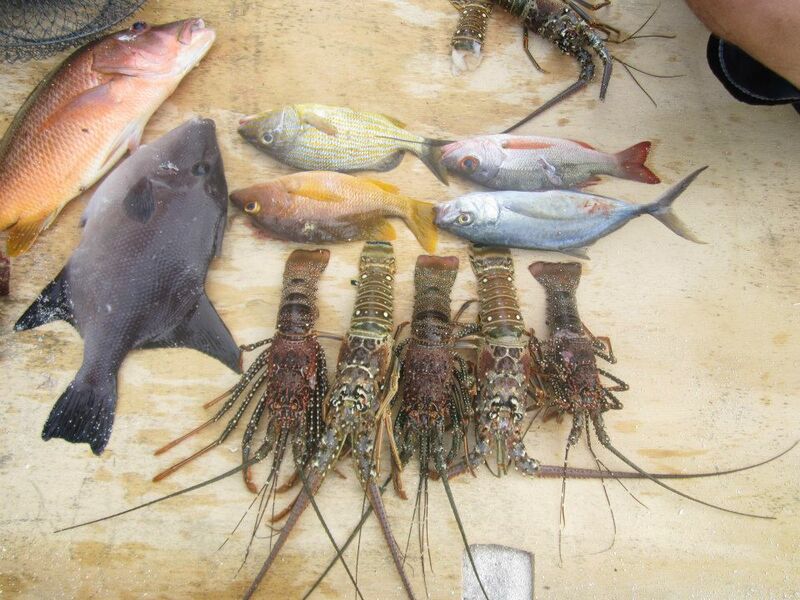 Mahahual lobster and some fish fresh caught. 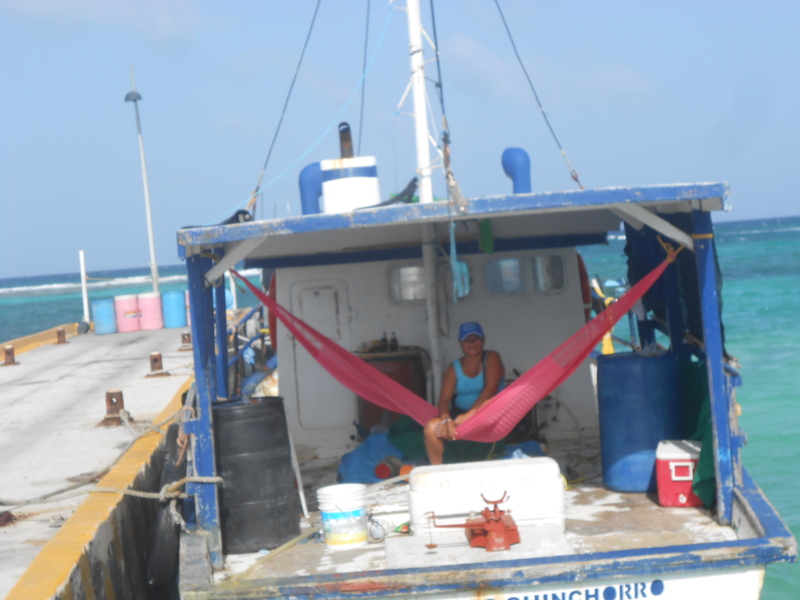 So if like lobster, like to eat lobster, like to fish for lobster, Mahahual has it. 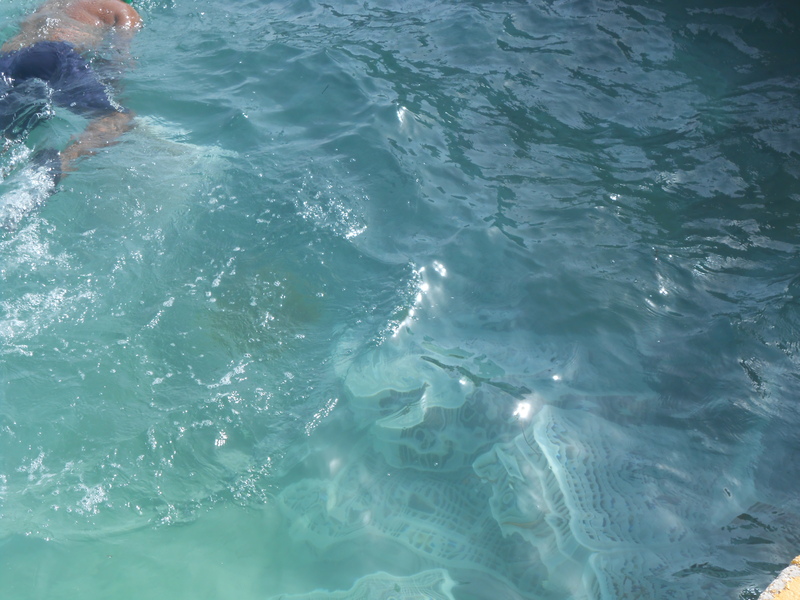 I have been told that because the waters around the reef and Mahahual are so clean and pristine that it gives the lobster a taste like no other you will experience. I came across this article in the local newspaper here ” Diario De Quintana Roo”, and I thought I would share. It concerns handicapped beach chairs. I translated from Spanish to English. New beach chairs for disabled. 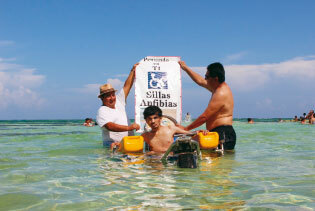 In an unprecedented act, a gastronomic establishment of Mahahual, called “Kimbara” acquired special chairs called “amphibious chairs”, which serve to join people with disabilities to enjoy the water and relax as anyone. The owner of this restaurant, Juan Carlos Gutiérrez Ortiz, the service is completely free and visitors can even be consumed in another site and use the chair to enter their disabled family water. Always good food on the malecon. 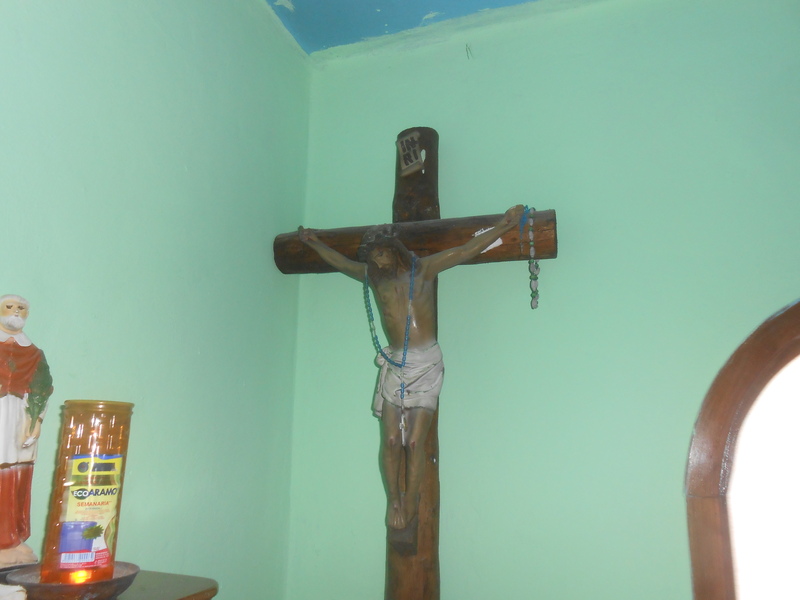 50 pesos. This article is so true, the majority of the folks in the USA and Canada have no idea what really is considered Mexican food down here. When I first got here I was surprised at the vast difference in what is Mexican food here and what is perceived as Mexican food in the USA. When I lived in Greenville, South Carolina I used to go to the Mexican restaurants a lot and I would drive through Taco Bell sometimes to pick up crunchy tacos and burritos for a quick meal. I always liked what I thought at the time was authentic Mexican food. I really had no clue about Mexican cuisine until I worked with some Mexicans at the Hot Dog King with my friend Gerald Brown. A couple of guys that worked in the back were from Veracruz, Mexico and they kind of turned me on the real Mexican food. I would trade them cheeseburgers and french fries for food that their wives cooked for them at home. I got exposed to mole, pico de gallo, empanadas, and other true Mexican dishes. So when I washed up on the old shores of Mexico, I thought I knew what real Mexican food was, well I was wrong. I eat most of my meals out because of my work schedule, so I eat a lot of local Mexican food. There are several ladies around town that cook meals for me and others and they cook basic Mexican cuisine. They prepare different dishes like, chicken mole, chicken in green sauce, pozole, chicken soup with vegetables, and many other authentic dishes. And guess what, none of these dishes come with sour cream. In fact the whole time I have been in Mexico have I ever seen sour cream in any of the local places I eat at. Another thing I have come to find out about local Mexican food is, they use every part of the pig, cow, chicken, and fish in the dishes. Fried chicken feet are popular here. When you get fish soup, the whole fish is in the soup, eyes and all. 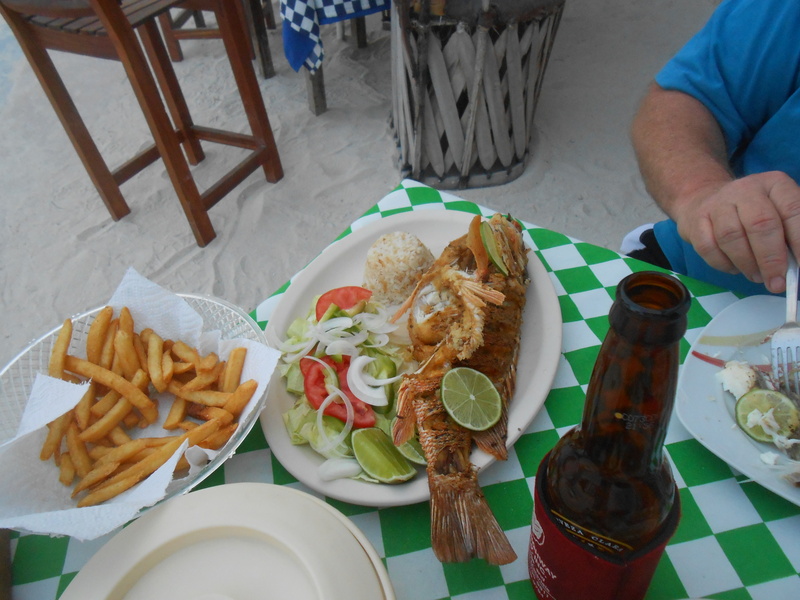 Fresh fish meal on malecon. Last year I met a couple from the USA on the malecon, and they both taught at Temple University and were in Mahahual on vacation. One day I ran into them, and the woman told me she had just had the best tacos of her life here on the malecon. I said where did you get them and she pointed to a guy with bicycle kind of taco cart on the malecon. Well I know this guy who sells the tacos pretty well, and he is a local fixture here. So I asked the lady if she really knew what kind of tacos she had. She said all I know is they great, and he told me they were “Cabeza de Res” tacos. I told her what she had just had been “cow brain” tacos. She then said, “Oh my God I am going to get mad cow disease.” I told her she would be fine that all the locals eat them, and they are fine. So I give her some advice and told her in the future always ask what you getting before you order because sometimes you may be surprised what is in it, because I have been many times myself. After I told her I kind of wish I had not, because she was probably better off not knowing. So I hope you enjoy the article below, it is from http://www.matadornetwork.com a website about Mexico that is English. 1. You have no idea what a real taco is. If you’re about to try a taco in Mexico for the first time, please erase everything you think you know about a taco. Other than the word “taco,” there’s not much else in common between a Mexican taco and an American or international one. First off, you probably think tacos have the following ingredients: sour cream, cheddar cheese, flour tortilla (or corn shell), and lettuce. Wrong. In Mexico, it’s practically impossible to find a self-respecting taco stand that would allow these ingredients to be put together. Negative on the boot-sized Chipotle-style burrito, although you can find something of similar size in Baja: a plethora of meat, veggie, and salsa options added to a massive baked potato. 3. You’ve never heard of mole, pozole, blue-corn tortillas, elote, esquite, chiles en nogada, chicharrón en chile verde, tacos al pastor, alambre, gringa, atole, champurrado…the list goes on. None of the above-mentioned dishes are easily found outside of Mexico, but they are some of the most popular things Mexican people eat. So as you venture into various eateries around the country, be open to the possibility of eating something you’ve never heard of, seen, or tasted before in your life. 4. You’re expecting flour tortillas. Although flour tortillas are relatively popular in northern Mexico and sometimes used to make quesadillas at suppertime around the country, they’re not featured in Mexican cuisine. To avoid disappointment when craving flour tortillas, find a restaurant that serves fresh-made corn tortillas hot off the comal. 5. You’re ready for margaritas and popping limes in your beer. Although the world thinks of the margarita as a Mexican drink, it’s highly unlikely you’ll find one outside of the tourist destinations. And if you think Mexicans love to shove slices of lime down their beers, think again. Sticking a foreign object into a beer is frowned upon — with the strange exception of the Michelada, wherein beer poured into a salt-rimmed glass with soy sauce, tamarind paste, clam juice, chili powder, lime juice, etc is somehow okay. Go figure. 6. You’re expecting Tex-Mex guacamole. Don’t expect to find the chunky, pureed guacamole you’re used to seeing everywhere in the States. Many places don’t even serve the heavenly dip, while others mix it with green salsa, making a soupy guacamole with strong lime and tomatillo flavors and less emphasis on the avocado. 7. You have no context when it comes to chili content. Many salsas in Mexico have a chili content that makes typical American / international-Mexican-restaurant-style salsa look like tomato sauce. 8. You fail to grasp the power of the tamal. When you see doñas with buckets of tamales, you’re not seeing just another street vendor, but the product of half a day’s work (or more) tending a fire, shaping corn masa in husks, adding chicken mole, or beans, or chapil leaves, or sweet elote. And then boiling them for hours. On days when it’s so hot you have no appetite, unwrapping a few steaming tamales can literally save your life. That’s how good they are. Someone sent this article to me yesterday. I think this article is so true. I have had some experiences like this myself. My quiet reading spot on the beach. Arriving at social gatherings in Mexico is a true art form. For Mexicans, it comes naturally. They know exactly when to show up for parties, coffee dates, dinners, etc without offending anyone or being offended by others. For expats, we need a few years of careful cultural study before we finally stop checking our watches in annoyance every time we plan a meetup at Sanborns. When an American says a party starts at 7pm, you can be sure that all guests will be there at 7pm (and leaving at 9pm haha). In Mexico, parties start whenever and end some time before everyone has to go to work the next morning. Hopefully I can help you jump ahead in your quest to being on time in Mexico by laying out what I’ve learned as an American in Mexico over the past 9 years. Step 1: Tell the person you would like to meet up with them the following day. Mention the general time (morning, lunch, dinner, night, etc), but don’t bother with an actual time just yet. Step 3: Now we’re getting into expert level. This is my secret to saving yourself a lot of headache… Text the person 30 minutes before the scheduled time with something like, “Getting ready now! See you in half an hour. Can’t wait!” This will help ensure they don’t forget or back out. It also gives them an opening to let you know if they will be late. Step 4: Arrive 10 minutes later than whatever time they plan to arrive. It’s ok because they will be 15 minutes late. Step 5: If for some reason you arrive after the other person, even if it’s 30 seconds after, you have to give a lame excuse. You can just quickly say, “Sorry, traffic was bad” or whatever you want, but you have to give some reason. Otherwise it would be awkward. I don’t know why. It’s just what you do. The lead-up to plans with groups of 3 – 10 friends is the same as with a one-on-one. (Confirm the day of, etc.) However, things get a little tricky because the time is likely to be pushed back further and further the closer you get. With modern technology, I recommend a text chat group with this group of friends so you can get a play-by-play. Be ready to leave your house at the set time. If you planned to meet somewhere at 8pm, that’s the time you should be putting your shoes on to leave. BUT… don’t actually leave your house until you get a text from someone saying, “Ok I’m here. Where are you guys?” This way, you won’t be the first to arrive, but you won’t be the last, either. If you show up within 30 minutes of a Mexican party’s scheduled start time, congratulations: you have just earned a spot on the planning committee. If you’re a family member of the host, you’ll be asked to run to Walmart to pick up soda, paper plates and tortilla chips. If you’re not a family member, you will have to help set up chairs and tables, then sit around in awkward silence waiting for everyone else to arrive. I try to arrive 1 hour after the scheduled time. That way you’re not the first person to arrive, but you’ve still made it in time to score the best taco ingredients and see the piñata. If you have close friends or family attending the same party, you can always call or text them to see when they plan on being there. While Mexicans are rarely on time for social events, they always try to be on time for business meetings, interviews, class, doctor’s appointments, exams and movies. Never, ever make plans with a Mexican on a Sunday. 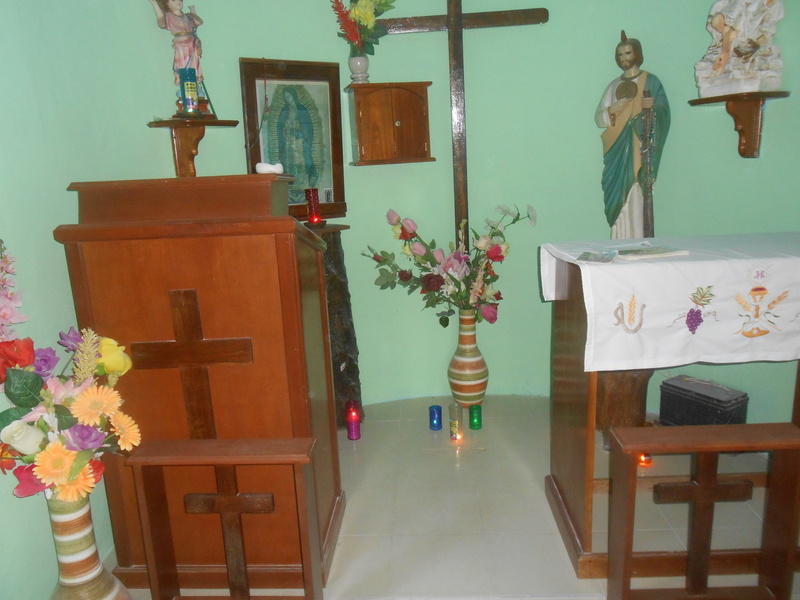 Sunday in Mexico is strictly family day, and unless they’re inviting you to their cousin’s birthday party or their nephew’s baptism party, there’s no way they’re going to make time for you. This is so true, it took me awhile to understand the time concept here in Mexico. I am an army brat, and when I grew up you were late if you were not there 5 minutes early. Our whole lives in the USA are dictated by the clock, and being late is bad, not here it is stylish. When I first started working at the port, if a ship was due to dock at 8am, I would show up at 10 or 15 minutes before 8. By doing that I was always the first one to work, and I used to have to sit and wait, while everybody else showed up 15 or 20 minutes after 8. I would sit and watch how almost all the Mexicans would come pouring into the port at the same time, 15 or 20 minutes after the ship docked. It has taken me quite a while to get used time concept here. But once you get used to it, you realize it is all relative. Things move slow here, and no one is in a real hurry. When I first got to Mexico, I used to get frustrated because when I went to a store to get a Coke or something it would take 10 or 15 minutes, not like in the USA where you run in and out. Here the cashiers are in no hurry, and neither are the customers. Now I just take my time, stand in line, and wait my turn. 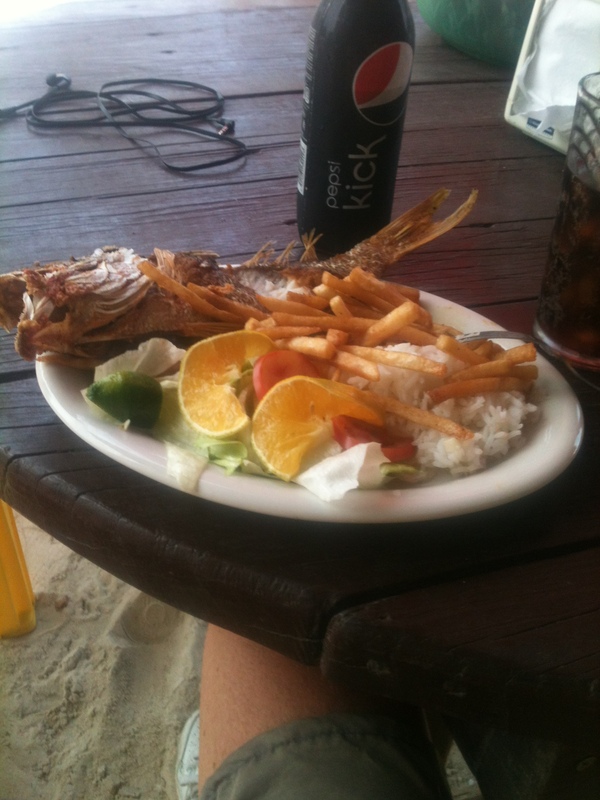 It is the same if you eat out at one of the local places in Mahahual. In the USA, we tend to run into a Burger King or McDonalds, eat and be on our way, not here. Even the fast food joints are not really that fast. I have gotten used to it. If I a football game coming up. or something I want to do, I go ahead and plan on taking a hour to get my food, or whatever, and plan accordingly. I have gotten to the point I where I take my Iphone with me a lot of times, and play games and stuff while I wait. I have a local woman I go out with sometimes in Mahahual, and I have learned that if are supposed to meet her dinner at a certain time, I don’t leave my place until the time we are supposed to meet. I used to have to wait 20 or 30 minutes everytime we went somewhere. So I asked her one time, why don’t if you are going to be somewhere at a time, tell me to meet you 30 minutes after the time that comes up in your head, keep me from waiting. So she looked at me and then said, “If I do that, then I will be an hour late, instead of 30 minutes late.” So the next day we were going to meet at Papi Pizza at 8pm. For some reason I was running late, and as I left my place at about 10 minutes after 8, I get a call from her, she is at Papi Pizza, and wants to know what is wrong, I was late, and that was not like me to be late, and she was there waiting. Lets just say I never brought up the subject of her being late again. 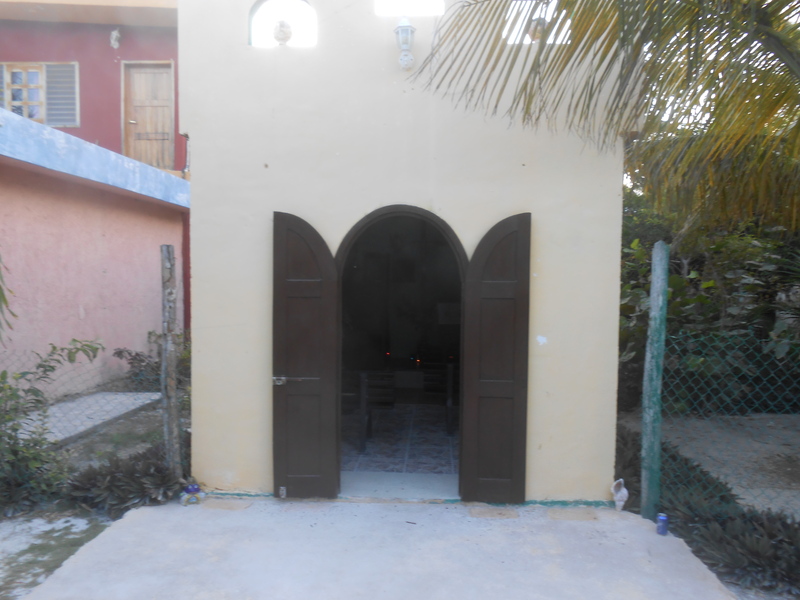 We have a saying down here in Mahahual, if you plan to meet someone down here at a certain time, you always ask that person if they are not a local Mexican( usually expats), ” Is that “Gringo ” time, or Mexican time. 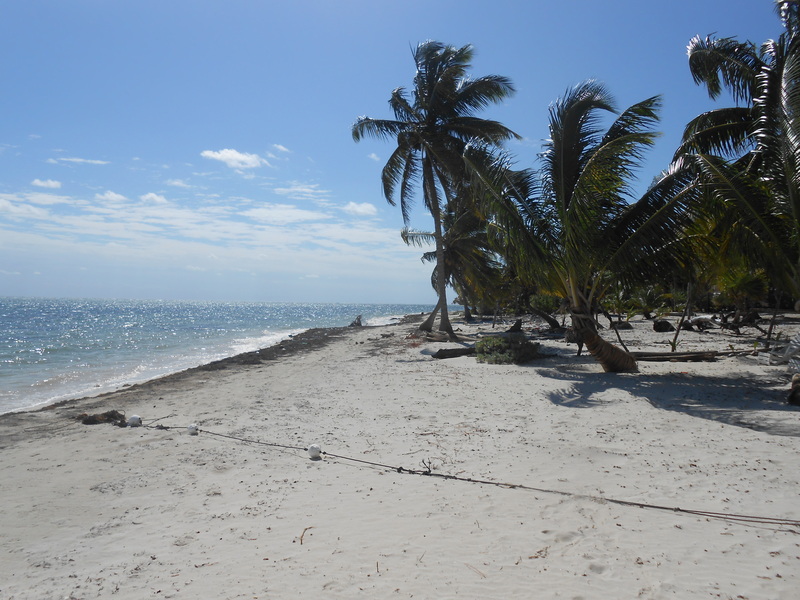 I read a lot of websites and I get a lot of articles from around the Costa Maya area to try to keep up with what is going on in Mahahual and Costa Maya. I came across this article below from the Mayan Beach Garden monthly newsletter, and I thought I would share today. This is a good article about everyday food shopping in Mahahual. What is good about this article , it gives a female perspective on how to shop and buy things at local grocery stores and tiendas. I would could never have written an article like this, or even thought of this subject. I tend to look at things through a man’s eyes. I just go into a store and just grab what I need, and have never thought about some of the content in this article. So after I read this article, I got to thinking that there are a lot of ladies and wives who read this blog and are thinking about living or retiring in the future, and would find this information helpful. So I hope you find this article helpful, it is a kind of how-to-guide on how to shop locally. 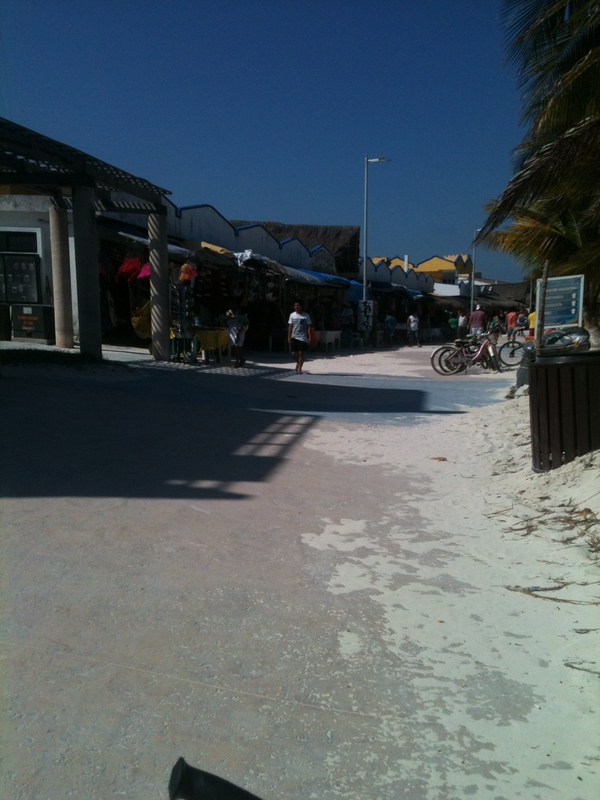 It is no secret — shopping in a town like Mahahual can be a challenge. There are no large grocery stores with beautiful produce and all the things you need in one place (such as a Chedraui’s). The nearest Chedraui’s is 90 km away. Most visitors to Mahahual have no idea that they can get most of the things they need in a mini-super, which at first glance, only appear to have chips and soda coolers full of drinks. Few of the vendors speak English. Learn as many food words in Spanish as possible or bring a translator on your smart phone so you can ASK FOR IT. Ask for anything you can’t find (hence the need to learn the words for foods). In a mini-super, you would normally need to ask for Avocados (Aguacates) . They may not be out in one of the bins. Don’t feel afraid to rummage through coolers piled with unidentifiable gray plastic bags and some kind of herb (usually cilantro) rolled in paper Maseca bags. Good things are hiding in there like mushrooms, red bell peppers, poblano chilies, carrots and spinach. The secret to buying Cilantro out of one of the rolls of brown paper is to either take the rolled up cilantro to the counter, or pull a handful of it out of the paper bag. Don’t assume that a store only has poor looking produce. Simply ask “Hay algo mejor?” (is there anything better?) and point to the bad produce. 75% of the time it works – they disappear into a back room and show up with beautiful produce. Because most of the stores are family owned and operated, you seldom receive a “NO HAY” (we don’t have it), unless they really don’t have it. But it never hurts to ask if they are sure. “La Verdad” (the truth?). Sometimes they go and check. Always be nice. If you are rude, they will ignore your request. They hate a mad foreigner (we must remember that we are foreigners). On the Yucatan peninsula stores are often owned by Mayan families and they don’t really like to shake your hand and they certainly don’t like to look you in the eye. If they look away when you say “Buenas Dias” they are just being polite in their culture. It isn’t being unfriendly either. If you see a freezer chest in the store, open it. If not sometimes there is a freezer in the back with frozen meats. Ask for something “out there” and you might be surprised. Most mini-supers carry fresher eggs than the super markets and you can buy just one egg if you want. Enjoy the experience. You may even gain a new friend in the store owner, especially if you frequent that mini-super. 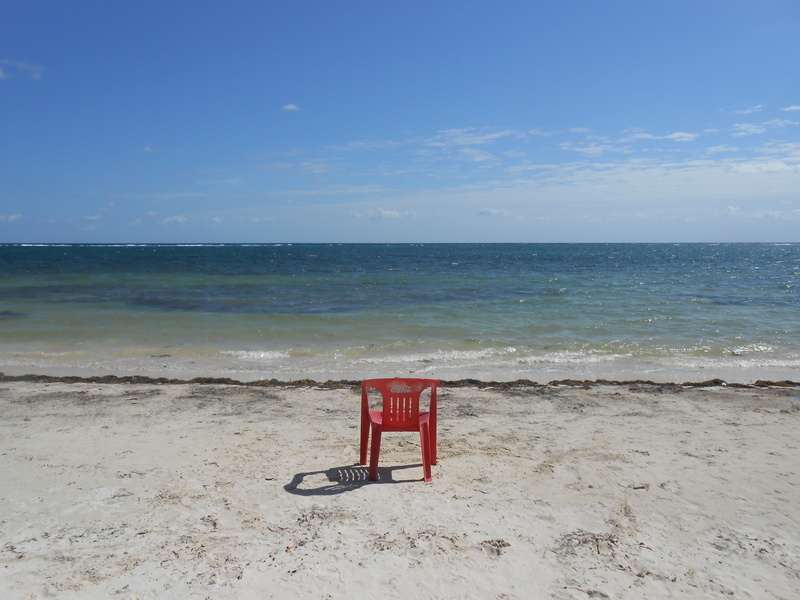 Marcia Bales. . .writing this from Placer and Mayan Beach Garden Inn – 20 km north of Mahahual. I myself, because of my job and where I live, I eat out a lot, because it is almost as cheap to eat out in Mahahual for a bachelor as it is to cook, and it tends to be pretty good. 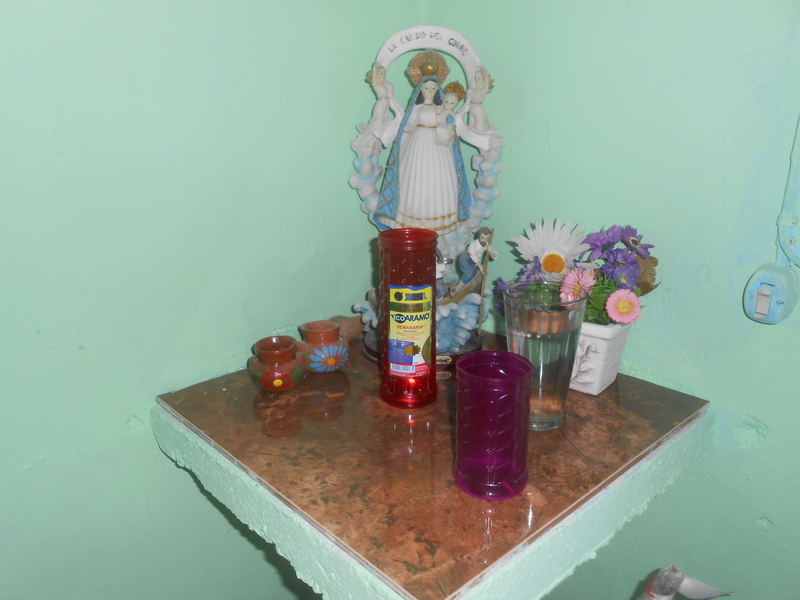 I have several Mexican ladies around the village who cook for me, and it usually costs me around 40 or 50 pesos. I tend to shop at the local stores for my Coke Zero, cereal milk, water. snacks, and that is about it. So I would never have thought up the content I shared today. All I know about shopping at the local grocery stores in Mahahual is, the people are friendly, they are patient if you don’t speak Spanish well, they are out of toilet paper a lot, (that is something I have been trying to figure out for 3 years, where is all this toilet paper going? ), and they take US dollars as well as pesos.